Sweets are my downfall. If there is something sweet in the house, I will find it and eat it. I'm lucky that I was given my dad's metabolism and have two very active kids that I am always chasing after to keep my weight down. It seems that my two sons have inherited my love of all things sweet and will literally dig around looking until they find the last cookie or piece of candy. This time of year is especially bad, I bake at least twice a week and every last bite is devoured by my family. We absolutely love baked goods. I make fudge frequently during the holiday months and I was interested when the October issue of Woman's Day magazine had a recipe for Candy Corn Fudge, which looked easy and a great way to use leftover candy corn from Halloween. This recipe has 7 ingredients. It makes 64 servings and takes a total of 2 hours and 25 minutes, 25 minutes of which is active. The ingredients are all basic and I already had or was easily able to find at my local grocery store. I made a few modifications to the recipe. Most importantly I chose to use a 13 x 9 inch pan instead of the 8 inch suggested by the recipe. Using the 8 inch pan the fudge would have been way too thick, instead of making 64 very small thick pieces of fudge I made 60 pieces of larger, thinner fudge. A word of caution, after the fudge had sat in the fridge for a day the pretzels became too soft. I would recommend eating this fudge soon after it is made. I followed the remainder of the recipe as written. The week after Halloween I was able to buy a bunch of bags of candy corn for less than a quarter. I had this recipe torn out for a while before Halloween and had never got around to making it. When I bought the clearance candy corn, I figured it was a perfect fit. Since this fudge is best soon after it's made in order for the pretzels to stay crisp, this fudge would be great for a fall or Halloween party. My two boys loved the candy corn idea, I actually thought the fudge was better without the candy corn topping. I found the addition of the candy a little too sweet. However, the fudge itself was delicious, I loved the combination of dried cranberries and white chocolate chips. Overall, a great basic fudge recipe with a twist. 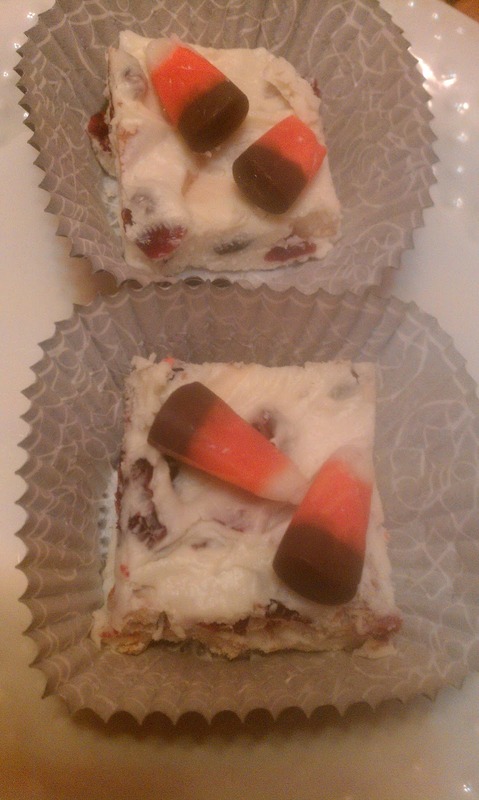 For the recipe go to Candy Corn Fudge. mhm sounds great! why do u call it candy corn, u use corn in your fudge? Great recipes on your site. I just started following you through the blog hop. Sweets are my weakness! :) I would love to try that yummy dessert! I hope you're having a great weekend! @Christymg Thanks :) Followed you back! @Shar I understand the sweets weakness, I have it too :) My weekend is going great, I hope yours is too! This is an original recipe and sounds really good. I too can't pass up sweets but only if they are in the house. I like the look of these too, isn't that vain, but they are so decorative for this time of the year.